Islamabad: The Fulbright Masters and PhD Program has been announced for Pakistani citizens. 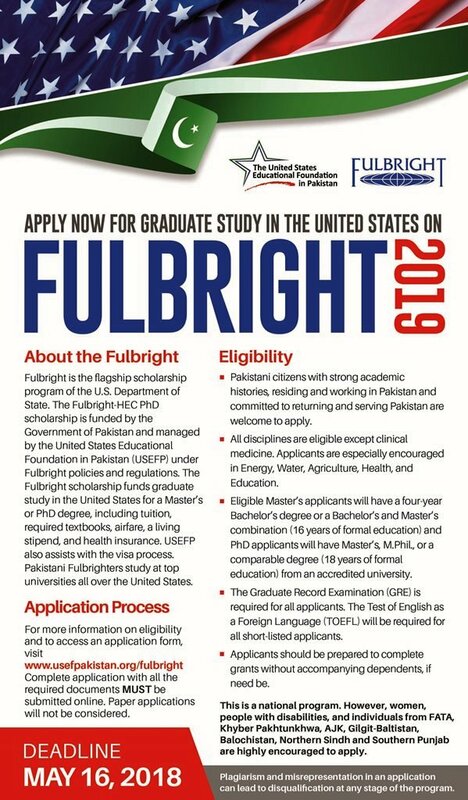 Deadline to submit your application for Fulbright Scholarships 2019 is 16th May, 2018. The programme funds graduate study in the United States for a Master’s or Ph.D. degree. Funded by the United States Agency for International Development (USAID), these grants cover tuition, required textbooks, airfare, a living stipend, and health insurance. USEFP also assists with the visa process. The Graduate Record Examination (GRE) is required for all applicants. Under the new scoring system, minimum scores of 138 in the verbal and 136 in the quantitative sections are required. Applicants must also possess a high level of fluency in spoken and written English. Short-listed applicants will be required to bring proof of TOEFL registration with them to the interview.